Ludus Duodecim Scriptorum, or Duodecim Scripta, is an ancient Roman game, which combined elements of luck and strategy. It is somewhat similar to Backgammon, in the fact that each player has 15 pieces, and the pieces stack and move on and off the board in a similar fashion. The name Ludus Duodecim Scriptorum in Latin, means The Game of Twelve Inscriptions, and refers to the fact that many Duodecim Scripta boards had a Latin letter written for each cell, instead of just circles. 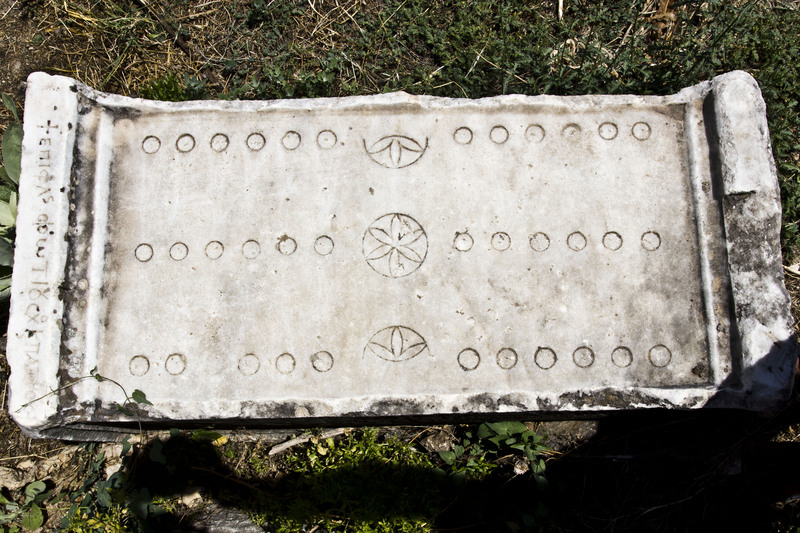 There is a theory that the reason letters were used and not circles or squares is because the game was used for gambling, which was prohibited during the later years of the Roman empire, and so the writing on the boards was used as an excuse to call them “inscriptions”, instead of gambling devices, thus preventing the users from being arrested and the boards confiscated. I emphasize that this is just a theory, because some of the inscriptions are so specific to gaming and gambling that it is really hard to believe that somehow the inscription would conceal the gambling aspect of the game. The three large rosettes or circles in the center of the boards were markers where the players would put the coins that were being gambled on. Marble Duodecim Scripta from Porta Portese, Rome, Italy. 1st-3rd century CE. British Museum 1892,0121.1. The earliest description of Duodecim Scripta has come down to us from a poem by Ovid, written between 1 BCE – 8 CE, Ars Armatoria (The Art of Love), III, 363. Latin text from Mozley, J.H. “Ovid: the Art of love, and other poems.” Loeb Classical Library. Harvard University Press (1957). pp. 144-145.
your pieces together is to conquer. English translation from Mozley, J.H. “Ovid: the Art of love, and other poems.” Loeb Classical Library. Harvard University Press (1957). pp. 144-145. From Ovid we learn that the game is placed on a board with 12 lines (cells), 3 dice, and that the pieces can be stacked in which case they are safe and cannot be knocked out. Duodecim Scripta in the Agora of Aphrodisias, Turkey. 2nd century CE. Photo: William Neuheisel, June 24, 2012. Duodecim Scripta. 100 BCE. Ephesus Museum, Turkey. Photo: December 12, 2006. 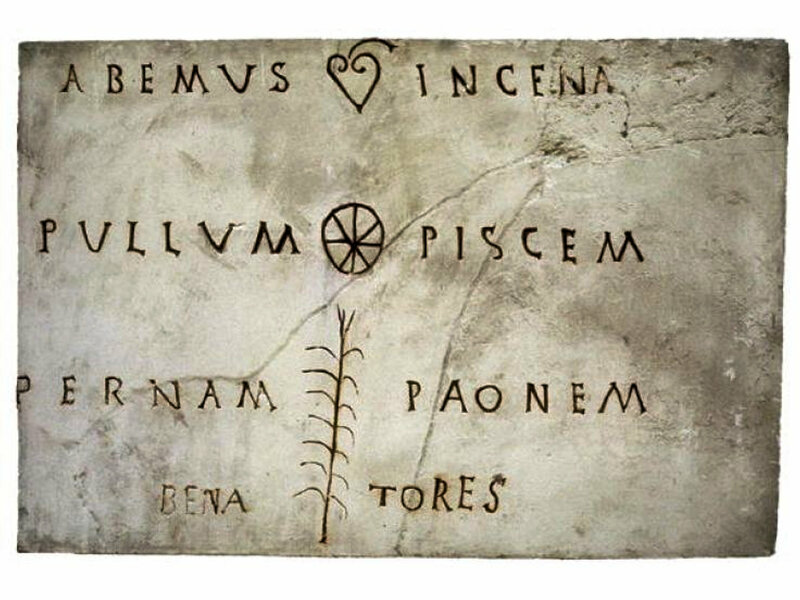 Duodecim Scripta boards are often found carved into the pavement stones at various Roman sites, where they have been played by Roman soldiers. 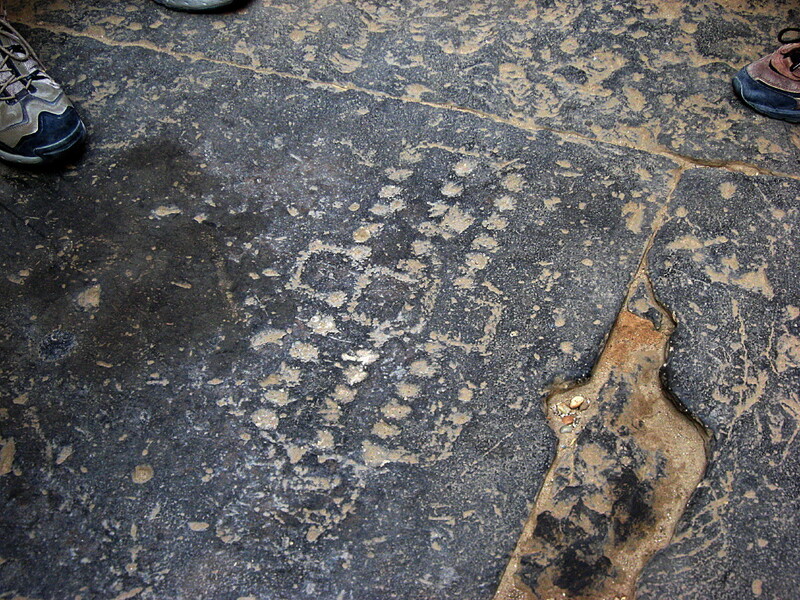 Duodecim Scripta scratched into the pavement of the Temple at Kom Ombo, Egypt. Photo: John Armstrong, September 27, 2007. Some of the inscribed boards contain various funny statements, the wit of which still resonates today, especially if we consider that these boards were used by gamblers. English Translation is from Bell, R. C. Board and Table Games from Many Civilizations. Courier Corporation, 2012. p. 32. Duodecim Scripta in Roman Laodicea, Turkey. Photo: Ian Scott, May 9, 2010. 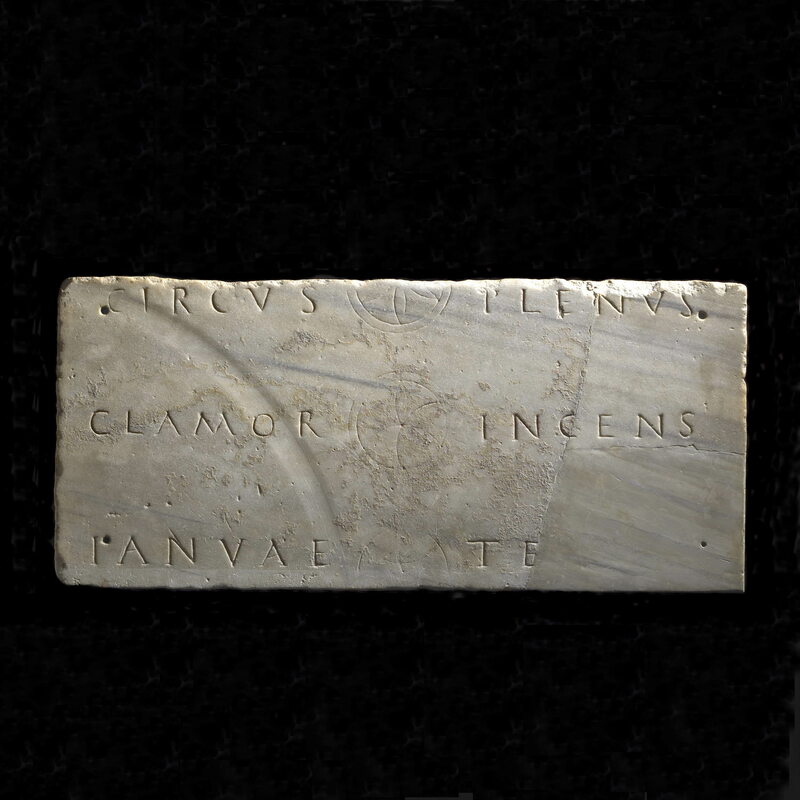 In my opinion, the funniest and most clever Duodecim Scripta board was a plaster cast from a tavern Rome, found between Via Volturno and Via Montebello, and kept in the Capitoline Museums, Museo della Civilta Romana, in Rome, which shows a menu that was served for dinner. Duodecim Scripta Gaming Board from a Tavern with a Menu. Found between Via Volturno and Via Montebello in Rome. Capitoline Museums, Museo della Civilta Romana, MCR 3574. Note that the word HABEMUS, was mispelled ABEMUS, on purpose, in order to fit in the correct amount of letters. The reason the game was written as a menu was probably to protect the tavern owners from gambling inspectors during the later years of the Roman empire when gambling was prohibited. Although there is no ancient record of the detailed rules for Duodecim Scripta, they have been reconstructed by HJR Murray and Roland Austin in the 1930s based on the game’s similarities to another Roman game, Tabula, for which the rules are known, because a game position lost by Byzantine Emperor Zeno was recorded by the Byzantine writer Agathias of Myrina (530-582/594 CE), in an epigram A.P. IX, 482. 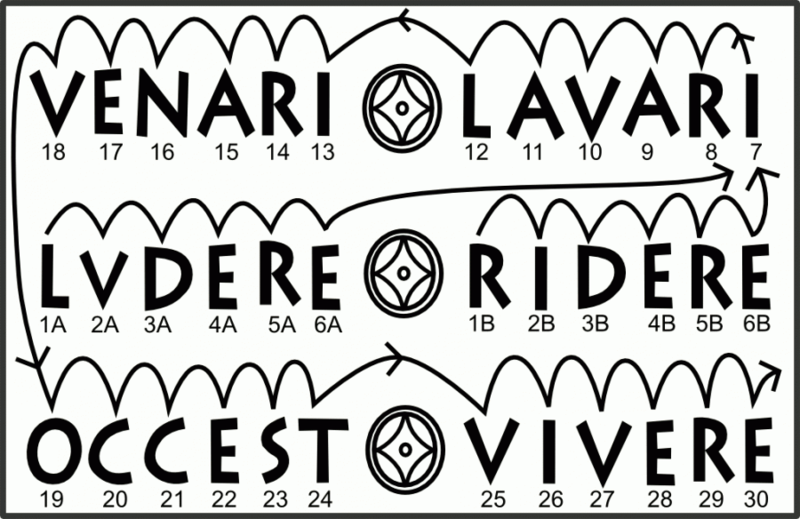 Roland Austin reconstructed the sequence of the movement of the pieces on the board, based on an inscribed board found in Ostia, where each cell was labeled by Latin letters written alphabetical order. 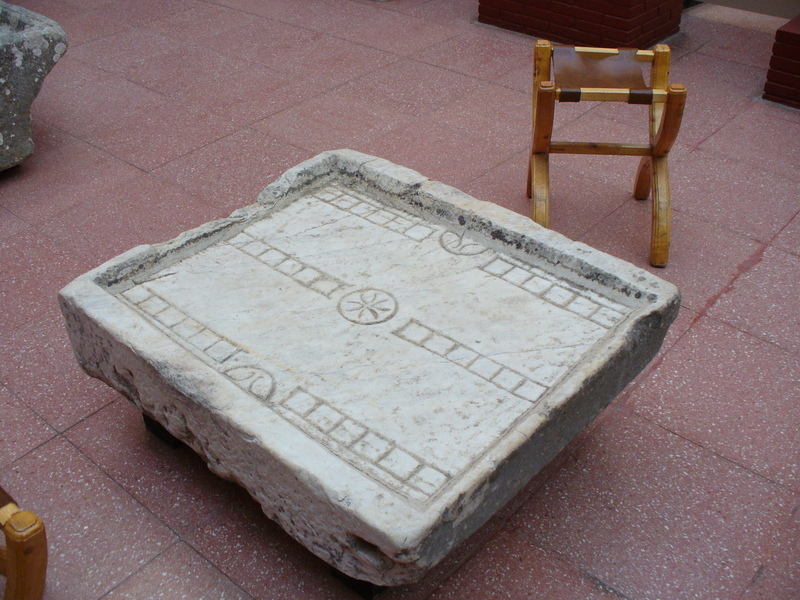 The board now is kept in the Ostia Archaeological Museum, in Rome, Italy. It is clear from this board, that the pieces enter the board on the middle row A, and then move from left to right to the upper row, right to left, B to C, and then jump over to the bottom row, D to E, and move left to right, until they exit off the board at the end of E.
Besides Murray’s and Austin’s rules, a few variations have been suggested by RC Bell, Jack Botermans, and Ulrich Schadler, in their respective books and articles. The rules that are documented here have been played by me and seem to make sense with the Ostia board inscription and Austin’s and Murray’s original recreation. They make a fun game, which can get pretty exciting. The board consists of 3 rows of 12 cells each. Each player gets 15 playing pieces, one white and one black, for a total of 30 pieces. There are 3 cubic six-sided dice, rolled simultaneously on each turn. Players decide who goes first by lot or by agreement. A player rolls all 3 dice simultaneously. Each die shows the number of cells to move by, either for three different pieces, one from each die, or for one or two pieces in sequence. Enter a new piece onto the board into cells 1a-6a or 1b-6b on the player’s side, based on the number rolled on one die. Move a piece that is already on the board by the number of points on one die. If all of the player’s pieces are in cells 25-30 they can move a piece off the board by moving it the exact number of spaces needed to remove it off the board. If a pieces was knocked off the board by the opponent, then it must be re-entered onto cell 1-6 based on the number rolled on one of the dice. Pieces of the same color can be stacked on top of each other to an unlimited height. If two or more pieces are stacked on top each other they are safe. The opponent’s pieces may not land on that cell. If the player’s piece lands onto a cell with only one opponent’s piece in it, the opponent’s piece gets knocked off the board and must be reentered back from the beginning onto cells 1-6, on the opponent’s next turn, before any other piece is moved. A player must enter all 15 of their pieces onto cells 1a-6a or 1b-6b on their own side, before the pieces can be moved further down the board. A player must place all of their 15 pieces onto cells 25-30, before the pieces can be moved off the board. The player who moves all of their 15 pieces off the board first wins. Since all Roman games use cubic six-sided dice, the probability of getting each value is exactly the same. Therefore the advantage of keeping certain spacing between pieces does not apply here as it does with Egyptian, Greek, and Babylonian games which used throwing sticks or conical dice, which had uneven probabilities for different values. The main stratagem in Duodecim Scripta is choosing moves that will stack pieces to keep them safe, and not leave any pieces by themselves on a cell which puts them at risk of being knocked out. Stacked pieces in multiple cells can also be used to block opponent’s pieces from making certain moves, especially in cells 1-6 and 31-36. Austin, Roland G. “Zeno’s game of τάβλη (AP ix. 482).” The Journal of Hellenic Studies 54, no. 2 (1934): 202-205. Austin, Roland G. “Roman board games. I.” Greece & Rome 4, no. 10 (1934): 24-34. Botermans, Jack. The Book of Games: Strategy, Tactics & History. Sterling Publishing Company, 2008. pp. 287-298. Murray, Harold James Ruthven. A History of Board Games Other Than Chess. Clarendon Press, 1952. pp. 29-34. Schädler, Ulrich. 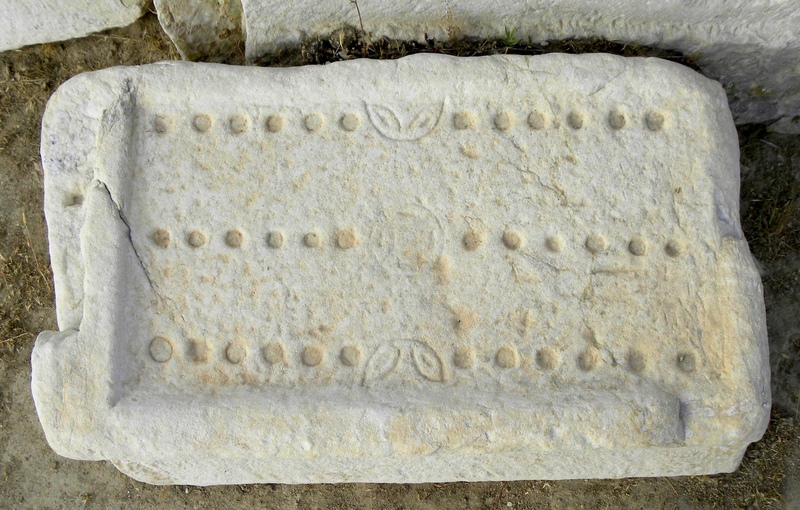 “XII Scripta, Alea, Tabula: new evidence for the Roman history of ‘backgammon’.” New Approaches to Board Games Research: Asian origins and future perspective. Leiden: International Institute for Asian Studies (1995): 73-98.